You may not know the name Bob Dixon, but you likely recognize the name Greensburg. 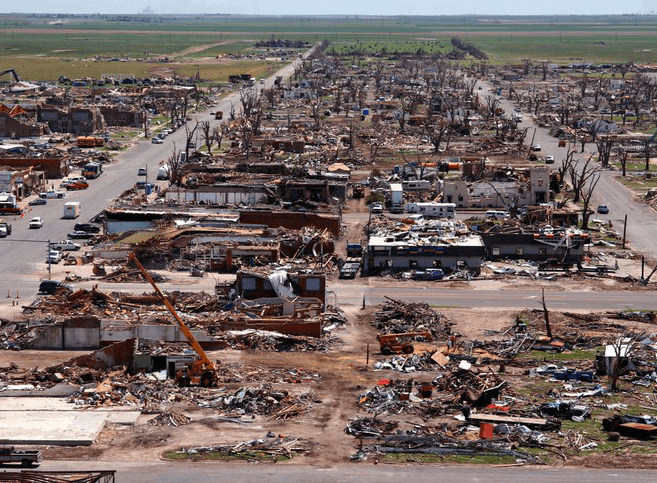 The city of Greensburg, Kansas was leveled by an F5 Tornado on May 4, 2007. F5 is the highest rating for tornadoes with wind speeds between 261-318 mph. 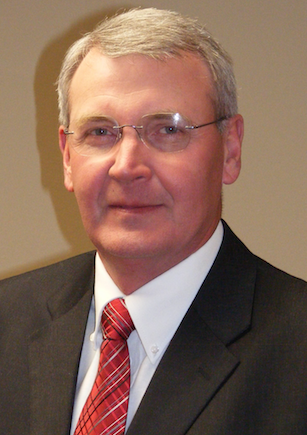 Bob Dixon was the mayor of Greensburg at the time and still is today. He said the tornado hit the community directly and as a result, 95% of the buildings were leveled to rubble. Once the debris was cleared away, Dixon said the community immediately started a planning process for rebuilding. And he said the community opted to do it using green building practices. “We wanted to make sure we got things that would be sustainable for decades, if not generations. It was this disaster that brought us to that thought process,” Dixon explained. He said rebuilding is never easy. Where do you meet when all of the places to meet are gone? The answer is…a tent. 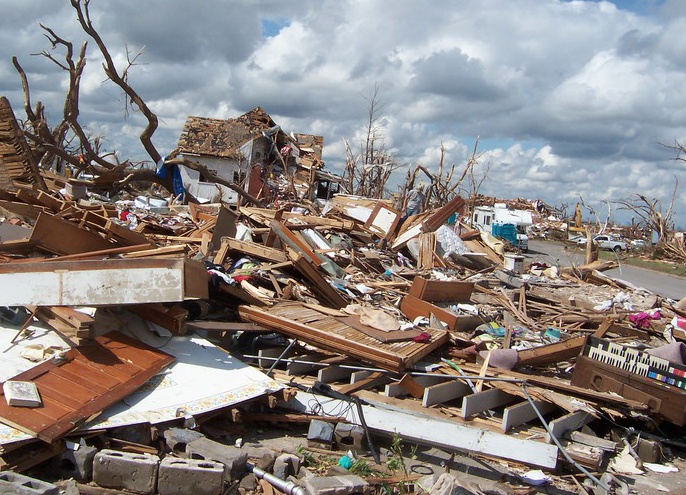 “Right after the tornado, there was no place in town to meet as a community. So that summer, we had a big tent in one of the parks on the east edge of town where we did everything as a community. We hugged, we laughed, we cried and we did our planning,” said Dixon. Hundreds of people showed up at the community meetings. Dixon said the process took about 12-15 weeks during that first summer. “We talked as a community about what the possibilities were and utilized resources from the outside consultants. There were all sorts of people who showed up with all kinds of ideas for us. But in the end, our long-term recovery plan and our sustainable redevelopment plan came from those community meetings and not a boilerplate from the outside,” he said. Dixon admits they had no idea that they would end up going green, at least not at the very beginning. But it didn’t take long to start thinking about the possibilities. When the discussion about green energy did come up, the community began to talk about what that would look like and what it would entail. “We wanted to know what the benefits were as well as the challenges. From the early talks about redevelopment, this green idea grew and eventually was implemented by each individual homeowner and business owner in the city,” he said. Dixon emphasized that though everyone in the city wanted to make sure they were being good environmental stewards, at the same time, they knew there had to be financial stewardship too. One thing that was presented to the city council at that time was the U.S. Green Building Council’s LEED Certification Program. 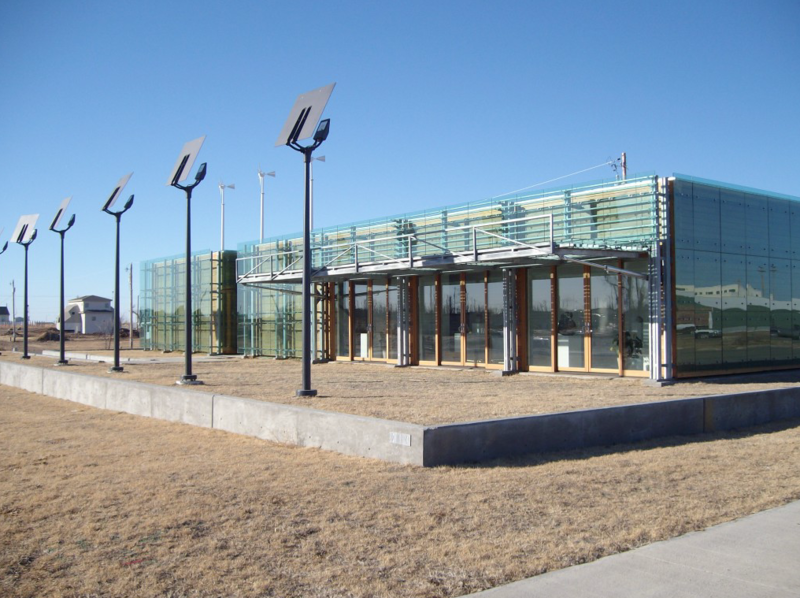 “In December of 2007, the city council passed a resolution that the city/municipality would strive to build their buildings back to the LEED Platinum Certification,” Dixon said. The Platinum Certification is the highest level LEED offers. Points are awarded in various categories including things like: indoor air quality, sustainable sites and water efficiency. Dixon felt that set the tone as a scorecard of what the city could do in terms of its building projects. “There were different technologies out there that we were able to implement. In addition to the city’s efforts, private businesses and homeowners took up the torch as well and built as green as they could with the green they had available (insurance money),” said Dixon. In Greensburg’s city hall, there is solar power. There is a geo-thermal well for heating and cooling. And there are 75,000 bricks that helped rebuild the city hall that were reclaimed from the rubble. “We utilized as many local building materials as we could. And then there are things like the lighting system, which is designed to take advantage of natural daylight. So if it’s a sunny day, the sensors detect this and the lights aren’t on as bright. But if it’s a cloudy day or it’s nighttime, the lighting shines at a brighter level,” he said. And that’s true of the school, the hospital and a lot of the city’s buildings. Dixon is proud that Greensburg has been able to cut its energy consumption. Green efforts continue in Greensburg, however the bulk of the major projects are finished. Most all of the municipal buildings and businesses that decided to build back or rebuild, as well as homes, are done. He sees the size of Greensburg’s Kindergarten through third grade classes as proof positive of this growth. “Those are our biggest classes at the school. So we are getting a lot of younger people back in the community and that’s what keeps your school and businesses going. You have to have that youth and those younger generations that decide to stay or move back to their community. It’s a great thing,” he said. One interesting side effect of the green rebuild is that there are now some green-based businesses in town. Endurance Wind Turbines sells small and medium-sized turbines for private residences, small businesses and even farmers. Dixon said they have done a great job of helping homeowners. 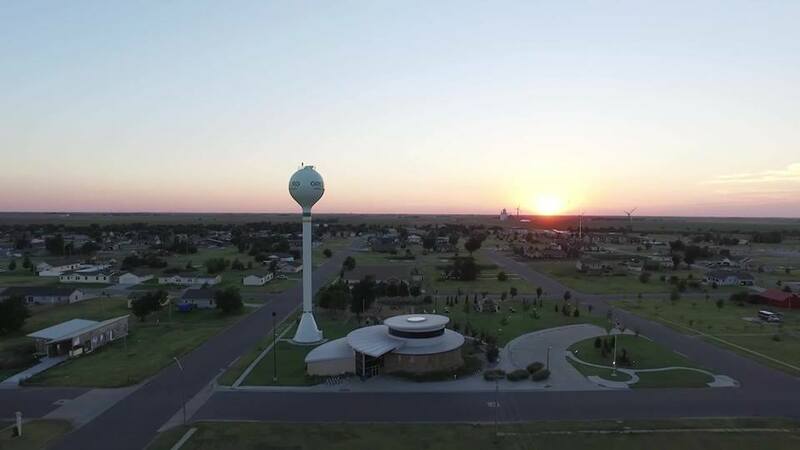 “There is also a solar company up in Hutchinson, Kansas, about 90 miles away that has done good work with people in the community getting them set up with solar power,” he said. Greensburg is a municipal-owned utility. They have a wind farm that generates electricity for the city. Ultimately, through the power purchase agreements and renewable energy credits, Dixon is proud that Greensburg can say all of their electrical consumption comes from the wind farm. “And that has really helped stabilize electrical rates. We have not had any rate increases since the tornado,” he said. Dixon believes other cities can do what Greensburg did in terms of going green but the key is to establish their goals and objectives at the outset. He explained it’s important for them to understand the character and values of their community and figure out just what they’re trying to accomplish. “You have to have a process in place to have “tent” meetings. You need to have clear cut goals and a vision of where you’re headed. This can’t be a feel good thing where you’re just wanting to get away from fossil fuels and look at something else,” he said. Though each community is different, the planning process can be the same. Dixon said he thinks Greensburg is even stronger today than it was before the tornado hit. He attributes that to the pioneering spirit people possess in the Midwest. “The people that chose to stay in the community and rebuild their lives have drawn closer together. One of the biggest benefits of the tent meetings was everyone being able to get together because it really started our healing process,” he said. Nearly 11 years later, Dixon said residents are still dealing with the aftershocks of the tornado. People are still struggling with emotional issues of loss. And he said that commonality has drawn everyone together as a community. “Great communication makes a community vibrant and strong,” said Dixon. FEMA told the residents of Greensburg that the rebuilding process would take about 10 years. Despite that, Dixon said everyone thought it would happen faster. But they realized, it’s does take time to go through the process of rebuilding and getting it right. Dixon will be the guest speaker at The Reader’s Earth Day Event on April, 2018. He said his presentation will have a three-pronged approach. First, he will talk a little bit about the tornado and what happened so people have a context for why the city rebuilt green. Then, Dixon will discuss the planning process the city went through as well as their thoughts on sustainability. Finally, he will talk about where the city of Greensburg is today. “We pretty well got everything going back and going good but we are not unlike other rural communities in America where jobs and employment are highly critical for maintaining a sustainable community. We are just trying to make our community a better place to live and work for those who live here now as well as future citizens,” Dixon said.